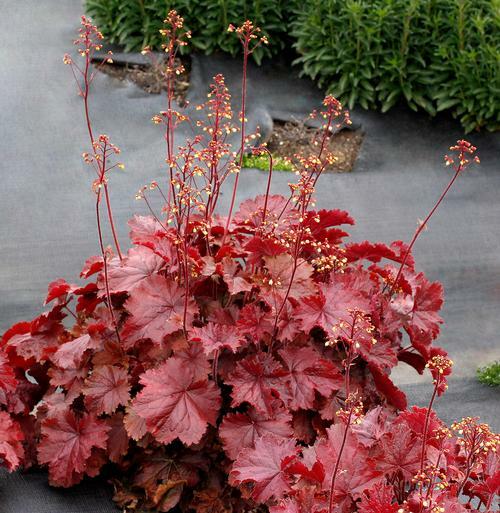 A Terra Nova introduction, this series of Coral Bells are bred from a Canadian native species known for its cold hardiness and clean foliage all season long, dense clumping habit with dark red leaves, yellow flowers appear in spring. Heuchera are clumping perennials with very colorful foliage and exquisite spikes of small bell-shaped flowers. Recent breeding efforts have added many new color variations to this genus. All grow well in partial shade and well-drained soil. They tolerate more sun with sufficient moisture. Plants bloom early to mid-summer.